This continues our coverage of the Criterion RV-6 Dynamax telescope that is among Company Seven's museum collection. The following is a photographic documentary of the extraordinary effort by Mr. Tom McDonough to refurbish his own Criterion RV-6 Dynascope. Mr. McDonough performed the work from May 2, 2004 and completed it by 24 August 2004. Over this time he took images and prepared his article which has since then been posted in the Gallery of the Astronomy Club of Tulsa web site. 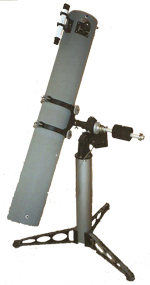 Right: Color image of the 1962 Criterion Dynascope RV-6 telescope in Company Seven's Museum Collection. Note the gray painted tube assembly with white Criterion Finder (23,751 bytes). the legs of his Pier are natural aluminum while ours are painted black, it is possible these were stripped by a previous owner. As we at Company Seven considered how much time and effort we would need to put in to restore 'like new' the Criterion RV-6 acquired for our collection. the thought came to us that Mr. McDonough had already saved us the effort of doing the work and documentation. And so the decision was made to conserve our Criterion RV-6 as it was acquired, and we asked the permission of Mr. McDononough to host the images he created instead. We put together this article with some additional explanatory text so that others can learn how to go about doing such a project. And maybe, just maybe someone out there will save another Dynascope from being discarded and make it as fascinating to the next generation. All the images are Copyright 2004 all rights reserved by Mr. Tom McDonough, used by his kind permission.